Katrell Antonio Platt releases the follow up to The Katrell Antonio Platt Tape (K.A.P. Tape) – The Restoration. 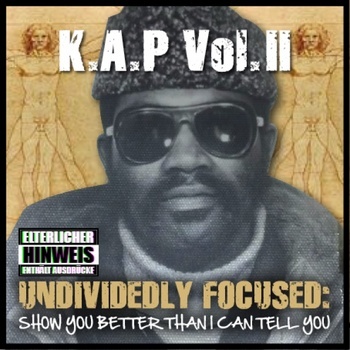 “K.A.P VOL II. CHAPTER I. The Roundup”. Upon returning from overseas after nine years, Katrell gathers up selections from his All-Pro team, and releases them as a welcome back project & gift to the world! Starring All3n F.; (Formerly Krazy Mike) Mike Lucas; (FLMF)- Boss Blacc; DJ Sauna; (100)- Valdrin Lamont; DiBiase; Mac Eternal; & Shawn Mays. TWIIN of (Castor & Pollux- TWIINZ) ; (Les4tunate Ent. )- Buddy Cuz; (Wolf Head Ent. )-Scrapp Pompey. Original beat productions from DJ Vybez & DJ Turnt Up (GMB); W.S.P’s Vet (@WooWSP); Ted Etheridge Music Box Studio. Download and listen to “K.A.P. Vol. II, Chapter 1 – The Roundup” on bandcamp now.